It is found that the American family of Crozier descended from the Croyser Clan, found on the banks of the (upper) Liddel, in the Scottish borderlands at Riccarton, and Hudshouse. In the sixteenth century the Crosars (Crozier) from upper Liddesdale to Teviotdale, then onto Fermanagh, Ulster, Ireland. Locus Crozier; IDs valley of Liddesdale, by locus of Crozier. 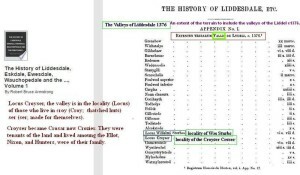 In R. B. Armstrong’s History of Liddesdale, there is a record of a Locus Croyser, but the word locus means locality, and is listed under Valleys of Liddesdale in 1376, giving the location of a valley of Liddesdale being wherethe people referred to a s Croyser lived. Today this valley is believed to be called Riccarton Burn. 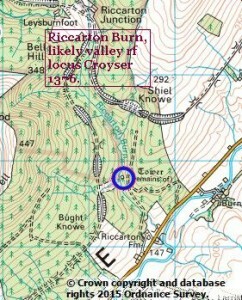 The spelling in William Croyser and Simon le Croyser near Croyland, and in “locus Croyser” is consistent in the fourteenth century, which strongly shows that the name which originates in the Valley (locus/locality of a valley in Liddesdale in 1376 by where the Croyser are living) of the Croyser, originated in the Croyland region. area not to far from Croyland. In the 13th Century the name Elwald (i.e. Elliot) is found in the region of Rye (Johannes (John) Elwold (Elwald) de (of) Rya (Rye). ca1230 ), near where the Battle of Hastings took place, and the Kerr which came to the borderland are said to befrom Normany. So it is felt a seed carrying the name Croyser, came to the Valley of the Croyser, now Riccarton Burn, in Liddesdale. Riccarton/Riccarton Mill (Rickerton, forms of Richardtown) second home of the Redheugh Ellot (Elliot) is near Larriston/Over&Nether Laristown. (lower in elevation). Ricardtoun/R. Cleuch Crosar and Elwald In Nether Riccarton Liddesdale 1541 rent rolls, was tenanted by Martin Crosar, Patrick Crosar, Rolland Elwald (i.e. Elliot), and William Elwald, and Over (upper) Riccarton was held by two Crosar farms. 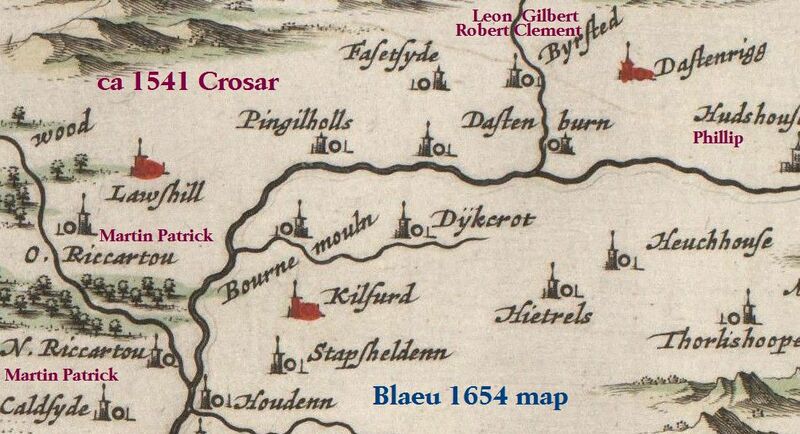 In 1576 an Andrew “Dande” Crosar was from Ricardtouncleuch. In 1590 was a Will Croser of Ryckerton (also spelled Rickerton). 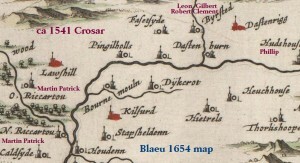 Crozier and Ellot in Upper Liddesdale Blaeu 1654 map. pre-Stobs ﬁre. 1586 Martin Elliot’s (intern Ellot clan chief) son Simon had a lease of land from Earl of Bothwell (Liddesdale, Braidlie). 1591 a Crown charter of Phillop in Selkershire and Braidlie (Teviotdale). Martin was called “of” Braidley, indication ownership of land of Braidley, but living on the Braidley Bothwell Liddesdale lease Martin supplied soldiers to the bordering Hermitage Castle. Simon and Martin of Redheugh, built a tower of Prickenhaugh in the region of Robert of Redheugh, now living in Lariston N&O, and the Riccarton N&O Crozier. 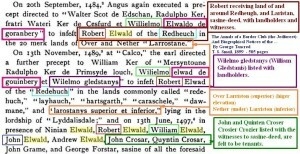 It should be noted that a John Elwald who witness the sasine (deed) of Robert Elwald of Redheugh, likely was John Elwald of Thorlieshill, near Hudhouse of the Crosar (Crozier), witness a Scott deed in 1488. Other words the Crosar/Croyser (Crozier) and the Elwald (Ellot) were close. Thorsliehope was land of the Elwald like Gorrenberry (next to Braidley) previous to Robert Elwald receiving lands of Redheugh, Larriston, Hartsgarth and other. 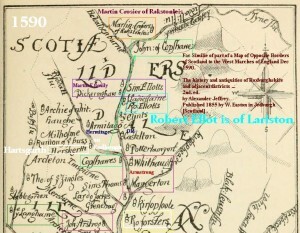 Jamie Telfer in The Fair Dodhead Telfer is sent to meet Martin Elliot, of Prickinhaugh, as shown on the Blaeu map as being near N&O Ricarrton, and N&O Lariston. 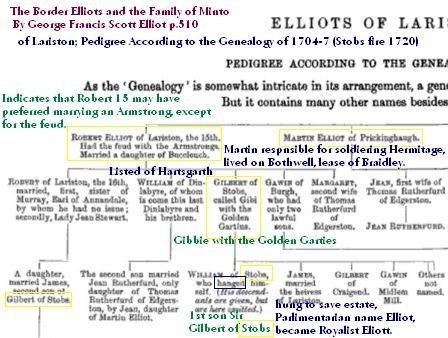 The Pedigree According to the Genealogy of 1704-7 (previous to Stobs Castle ﬁre of 1712) ELLIOTS OF LARISTON ; Robert Elliot of Lariston, the 15th, had a feud with the Armstrongs. Married a daughter of Buccleuch. His next brother was Martin Elliot, of Prickinhaugh. The Crozier Hudshouse is in the vicinity of Slaughtree, home of a Margaret (Meg, Megg, Maggie) Kidd mistress to Redheugh (Robert 15) now of Larriston, which he builds a tower for her at Hartsgarth. Second son living in Larriston with his father Robert chief 15, is William then of Hartsgrath with his mother (rf sansine/deed). Next son Gilbert “Gib-bie of Golden Garters” is said to be born of a father of Larriston, and a mother of Buccluech (Kidd’s curse, Kidd’s wall). Though a Hob Elwode (i.e. Robert Elliott), lived and was taken in by his uncle Clemyt Crossier (i.e. Clement Crozier) of Stobbes (Stobs) became Clementis Hobs, Gavan Ellot was ﬁrst Ellot owner of Stobs, second husband to Gilbert’s mother, purchases Stobs for his grandson (ﬁrst son of Gilbert) William. Gilbert marrying Mary “Fendy” ﬁrst cousin to Buccleuch gave William the blood of a Buccleuch. This William (has ﬁrst son Sir Gilbert) changed his support to Buccleuch (King Charles II), then hung himself so the Cromwellian Parliamentarians, would not take his estate. 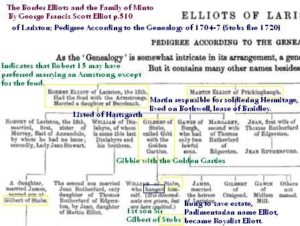 From this William, to indicate loyalty to the Royalist, and to diﬀerentiate the name from the Parliamentarian, Sir John Elliot which died in the tower of London, the family of the Clan Elliot chief of Stobs/Redheugh spells their name Eliott. Redheugh Elwald sasine (deed); Crosars witnesses. In Ulster, Ireland the name Crozier (1659, Croser 1630) was introduced by settlers who arrived from England and Scotland, especially during the seventeenth century with strong associations with Counties Fermanagh and Armagh. The Scottish, and other border people followed a similar path migration from The Liddel Water which is a Lower Liddesdale, not showing Croziers. had towers along the Liddel. The Armstrong, and their allies, believe like indigenous Americans, that land is of the common. Previous to the Redheugh sasine, the Armstrong Mangerton lands were re-granted by Arhibald “Bell the Cat” Douglas V Earl of Angus to Scot of Buccleuch. That is why the Armstrong are not on sasine. Near burn of same name, tower remains verily exist, and a peel house at Hudshouse poscessed by this clan. Scotts of Buccleuch, Vol II page 174. Hudhouse was a two story housewith dual doors, making it a strongly built huddle house. What one would call a “Hudshouse”. Hudshouse had recent farming up to about 1890, but in ruins with slight remains of an ancient tower of the Croziers. Philippo Crosar was recorded on the Rental Rolls of Liddesdale, being a tenant at Hudshouse in 1541. 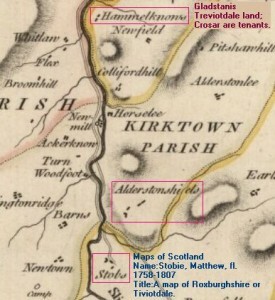 Hudshouse is below foot of Helcaldenburne (Caddroun Burn), on Liddel (refer to; Blaeu map of 1654). Rakestonleis is of Caddroun Burn Tower (Helcaldenburne 1590) of Martin Crozier. 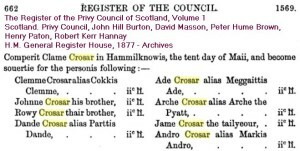 The family becomes Treviodale Crosiers of Alderstonshields, with nearby Clement Crosier in Stobs migrating north Clement Crosier on Gledstanis estate land to Hummelknows just south of Hawick. (1569). 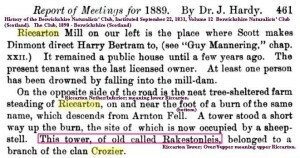 Crosyer, Crosier, Crosser of Agerstoneshields-Alderstonshields and Stobs. 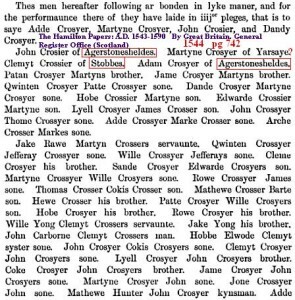 Crosyer, Crosier, Crosser of AgerstoneshieldsAlderstonshields and Stobs, on Gladstanis estate in Treviotdale, 1544 Hummelknows, Crosar which are surities (in bond) by Clem Crosar Sureties/bonding of Crosars by Clement Crosar of Hammelknows; Gladstanis land in Treviotdale of Hammelknows, Alderstonshields and Stobs, which Crozier (Crosar) were tenants; Gledstanis land which Crosar are tenants. The relation between the Crosare (Crozier), Elwald (Ellot), Home (Hume), in the Minto (Wolﬂee/Wolfhopelee) regions is shown in a Declaration of Sasine to David of Home 1436, when a Johannis Elwald, and a Jacobi Crosare witness the deed of David Hume receiving land from of Wolﬂee and Wolfhopelee from William Douglas. John Croser sword only is listed in the ca1630 munster rolls of Tully Castle (1630 Tully, Monea, and Tullykelter Castles exist, but Castle Hume was built later) the Barony de Magherboy, Fermanangh, Ulster. Croser, Ellot and Hume in this same region as found two centuries earlier, in southern Treviotdale with Sasine of David Hume. Maghereboy, Fermanagh, Ulster, Hume, Hamilton and Somerville lands of Tully, Monea, and Tullykelter Castle lands. In 1659, Crozier were listed in the Census of Fermanagh/Armagh, Ulster. 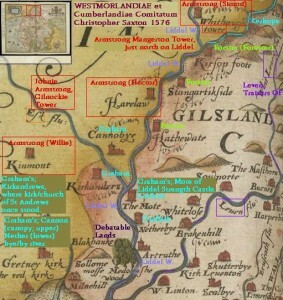 1528 IN DEBATABLE LANDS; Of the Armstrong, Ellot, Nixon and Crosar; the most numerous in 1528 are the Armstong then Elwands, Ellwoods, or Elliots who extended into Teviotdale, Nixons which are more numerous in Cumberland than Scotland and the Crosars in Upper Liddesdale with their chief stronghold at Riccarton. A CENTURY LATER IN ULSTER; Across the water to Ulster into the counties of Fermanagh which now borders Ireland, and Armagh. Given numbers for the Armstrong, Elliot (Ellot), Nixon, and Crozier(Crosar) of Fermanagh and Armagh, shows these two counties were steppingstones, into the English Plantations and around the world. 1735 December 29 – An intent to marry is recorded in Kings Chapel for John Crosier and Martha Lindsey. 1735/36 January 13 – John Crosier marries Martha Lindsey at Kings Chapel (Episcopalian). Were like many Crosier/Crozier of Ulster (Scot-Irish) would have been Episcopalian. Traditionally the Philadelphia, Pennsylvania Crozer (Crozier) family was founded by ﬁve brothers, Andrew, John, James, Robert and Samuel of Northern Ireland (Ulster), arrived in Philadelphia about 1723, unrecorded parents were likely with them. Norwalk, Conneticutt, Richard Cozier (Crozier), wife Abigail Brown listed in deeds of 1709 deceased 1724. A publication of the Scottish Border Council Contains regional names of the Hermitage Castle region, including Lariston, Riccarton, and Thorlieshope in PDF.